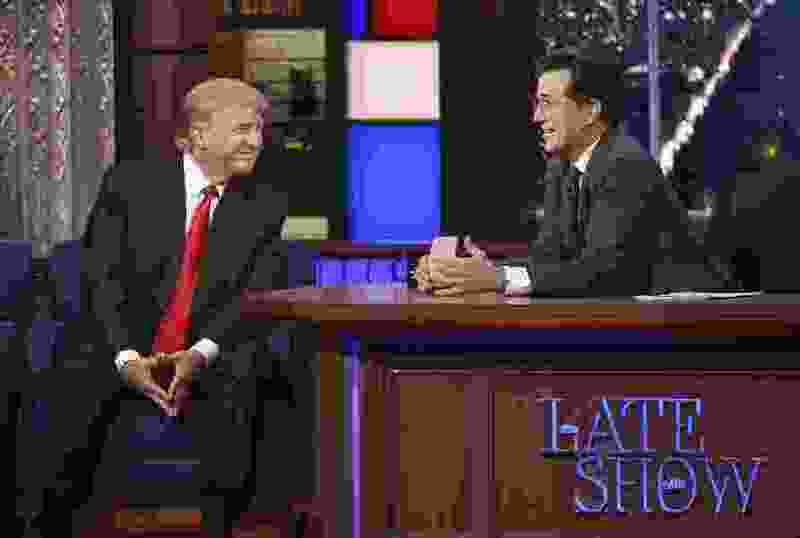 ( Jeffrey R. Staab | CBS ) Donald Trump appears on “The Late Show with Stephen Colbert” in 2015. Tune in to an episode — any episode — of “The Late Show With Stephen Colbert,” and it’s quickly clear that the host is not a fan of Donald Trump. It was tough. It was pretty mean. And it is hugely successful. Trump loves to claim that everybody loves him, and in the case of Colbert and CBS, that’s perversely true. Since the 2016 election and his all-Trump, all-the-time policy on “The Late Show,” Colbert has become far and away the most popular, most watched late-night host on TV these days. It’s getting to the point that it isn’t even a contest. His “Late Show” just had its best second quarter (April-June) since it debuted in September 2015, averaging 3.63 million viewers and trouncing its nearest competitor (“The Tonight Show Starring Jimmy Fallon”) by 1.2 million viewers, a 51 percent advantage. (Photo by Charles Sykes | Invision via Associated Press) Jimmy Fallon, left, and Stephen Colbert attend The Metropolitan Museum of Art's Costume Institute benefit gala celebrating the opening of the "Heavenly Bodies: Fashion and the Catholic Imagination" exhibition in May in New York City. NBC has been quick to point to Fallon’s success with advertiser-friendly demographics — viewers ages 18 to 34 and 18 to 49 — as he fell further and further behind in total viewers. But “The Late Show” tied “Tonight” in the demographics in the second quarter. And, while the audience for the consistently anti-Trump “Late Show” continues to grow (up 5 percent from 3.46 million in the second quarter of 2017), the “Tonight Show” audience continues to decline (down 15 percent from 2.83 million to 2.41 million). “Jimmy Kimmel Live” pretty much held steady, declining slightly from 2.12 million to 2.10 million. Certainly, the current late-night landscape was greatly affected by what happened on Nov. 8, 2016 — the day Trump was elected. 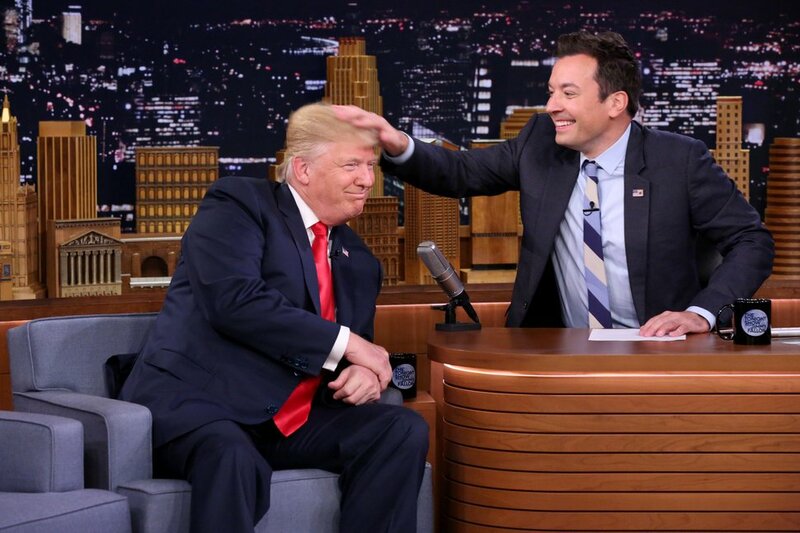 But it was also influenced by what happened on Sept. 15, 2016, when Fallon had Trump on as a guest and playfully mussed his hair. Fallon was blamed for attempting to normalize Trump, ignoring all the controversial things he'd said and done in favor of goofing around. And Fallon's ratings have been in decline ever since. (Andrew Lipovsky | NBC via Associated Press) In this image released by NBC, Republican presidential candidate Donald Trump appears with host Jimmy Fallon during a taping of "The Tonight Show Starring Jimmy Fallon," Thursday, Sept. 15, 2016, in New York. Fallon told The Hollywood Reporter he doesn't care about ratings, but then got choked up when he talked about the backlash. "I'm sorry. I don't want to make anyone angry — I never do and I never will,” Fallon said. “It's all in the fun of the show. I made a mistake. I'm sorry if I made anyone mad. And, looking back, I would do it differently." It’s not a coincidence that, for the second year in a row, “The Late Show With Stephen Colbert” and “Jimmy Kimmel Live” received Emmy nominations as outstanding variety talk series; “The Tonight Show Starring Jimmy Fallon” did not. Trump, himself a two-time Emmy nominee (“The Apprentice” lost both times), has a long history of claiming he’s at the center of, well, pretty much everything. But in the case of late-night TV, he genuinely is. The president made Colbert No. 1 and rising. And he made Fallon No. 2 and falling.